the opening track begins with powerful, shifting pad, perfectly blended with reverbed, effected ‘snare’. later on, echoed bleep comes with tight beat. the only bad side is that the track is a bit too repetitive, for my taste, at least. but, to put it short: what an amazing electro-ambient track. this even would go as a warp -release. this is an different perspective to the first track by lackluster. i liked this edit more than the original one. this edit is a bit heavier, with more aggressive beat. personally i like lackluster’s style very much, and it shows also on this track. good job. this track starts with a semi-complex beat, which nearly goes through the whole track, excluding the few pauses. the are a few ambient strings/ chords, and especially the one which is dropped in through the whole track, in times, sounds nice. a great track, imho, but not the best one, though. the start is perfect: a smooth blend of strings, bouncing on. beautiful, minimal ambient sound, without any irrelevant parts disturbing the harmony. when voq-ep came out, i thought that coan3 was the best ambient i’ve ever heard. but then comes coan5, which is, in my opinion, better than coan3. overall, gaylab cd is finished, perhaps a bit more professional than vetac, but if you ask me, i put them both on a same line. again, ceniq is proving his amazing talents composing wonderful ambient or electronic tracks. this cd would really go as a warp-release. but it’s better when it’s free. and the last word from the cover artwork: it’s superb! 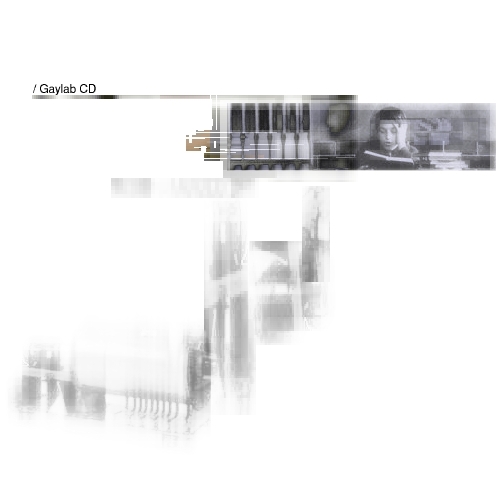 it really shows that gaylab cd is a finished product. Amon’s tilt goddes mix: I asked amon, a good friend of mine, to do a mix of Gaylab for me as I like his personal touch in his music. Amon hadn’t had the time to do any mix for me and I was going to release Gaylab soon as I heard his latest tune “Tilt Goddes” which originally was a part of Droids Killed My Audio series (part 4 in fact) and I insisted him to give it for this Gaylab CD. I’m happy he did give it. Lackluster’s reconstruct: I gave mr lackluster Esa Ruoho an unfinished version of Gaylab to remix (it was only about one and a half minute long) and he did a marvellous job mixing the original patterns and riffs with new drums and ideas. I actually got some ideas from his mix for my final “original” Gaylab – that’s why you might hear some similarities in his mix and my edit. Salice’s backmix: I liked salice’s flud mix (which appeared on Vetac CD1) very much so I had to get him to remix Gaylab too. Salice did a very nice ambient remix with some fast beats leading the first half of the song. Nice stereo flanges and hipass filter sweeps give a nice sound to the drums and the end part’s ambient pads and reverbed speech samples make just a beautiful combination. And thank you Antti for totally awesome Gaylab cover art. I just love your work.